The Spirit of St Bernadette Mary School Award is a very competitive and much sought-after award which every pupil attending the school would cherish to earn. Eileen Fray sponsors this award and having spent her working life in education she believes being a good pupil is not just about the grade you achieve in your examinations. A good all-rounder who is a mentor for other pupils and embraces the ethos of the Spirit of SBM School Award is chosen by the teachers after much deliberation. The 2016 Spirit award winner was Harrison Mgoti who comes from a humble family background in the Mtepeni area. Mama Mary & Papa Kevin came across the family eight years ago, some of their very good friends Edna and John Mellor have been assisting the family financially ever since and as a result the family manages to survive in impoverished living conditions. Harrison has been brought up by a single parent over the past few years and is the 3rd born in a family of 6 children. Mama Harrison works for three days weekly on the shamba at The GLO and then earns some extra money by working as a casual labourer on other farms in the area. 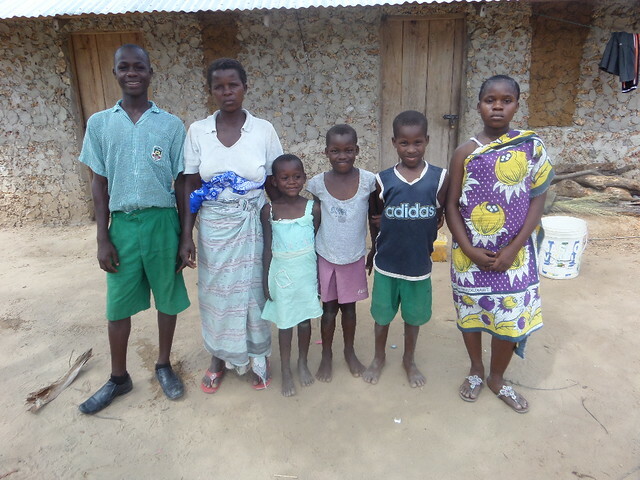 It is a difficult life for both the mother and her children but they are always very positive in their outlook for the future and with the financial assistance from Edna & John Mellor their burden is eased each month. Despite the challenges he faces at home, Harrison has transformed from being a troublesome boy at school to one of the top performers in his class. He is also a natural leader encouraging the other children at SBM School to behave well and strive to improve their grades. Harrison is determined to even score higher and get a chance to join a good high school. 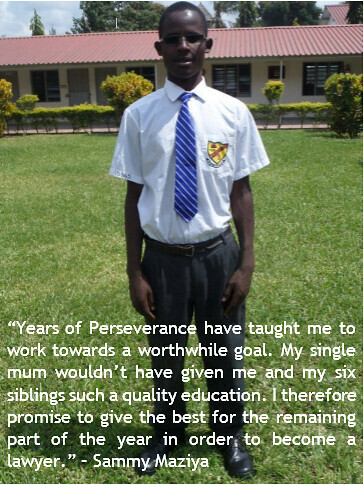 He intends to become a neurosurgeon and realises that he needs to excel in his high school education. Luckily his older brother Sammy is being sponsored at high school by The Smalley Family from Bury and he is also a great role model for his siblings. 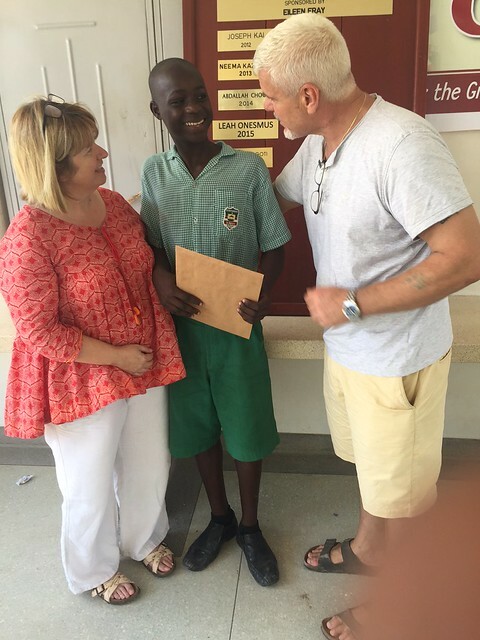 As a reward for winning this coveted award Harrison received a pair of Bata shoes, some socks, polish and polish brushes along with a cash prize that will ensure the family have an enjoyable Christmas and they will have the Kenyan equivalent of a Christmas Dinner. Harrison was beaming with pride and excitement when he opened his gifts. SBM is a good school offering sounding environment for one to concentrate with his studies and Harrison is thankful for having the opportunity to study at SBM and the good moral values he has gained from it. He would love to help his family members and the community in future. Harrison wishes to thank all at SBM who have nurtured him thus far and ask for God’s blessing upon them. 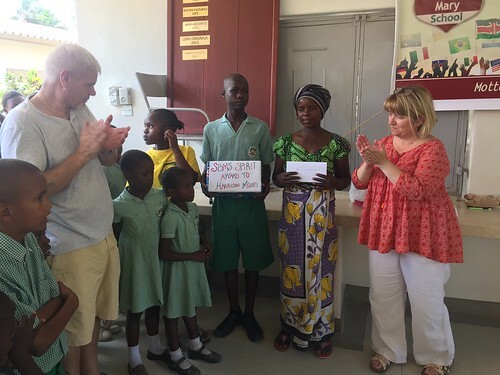 Also a special word of thanks to Eileen Fray, introducing the Spirit Award in SBM School has made the children very aware that it’s not just the grades you achieve in examinations that is the No1 priority, it is showing kindness and respect to your fellow pupils, your parents and the staff at SBM School. Harrison epitomises all these qualities and we wish him every success in his life ahead as he progresses through his academic years. Many many congratulations to Harrison. 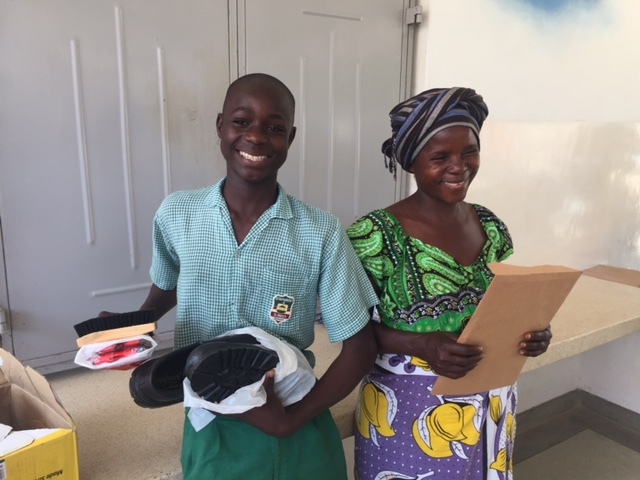 It’s wonderful to hear he has goals and aspirations for the future and that he shows such deep respect for his hard working mum and the wonderful staff at SBM. I send my love and warm wishes to Harrison, his family and you all there. I keep you in my thoughts and prayers always. I’m delighted he liked his gifts; he clearly deserves them. Well done, Harrison, and God Bless.